Today I will show you the EASIEST possible way to make a LOG CABIN block. WITHOUT measuring any strip length! 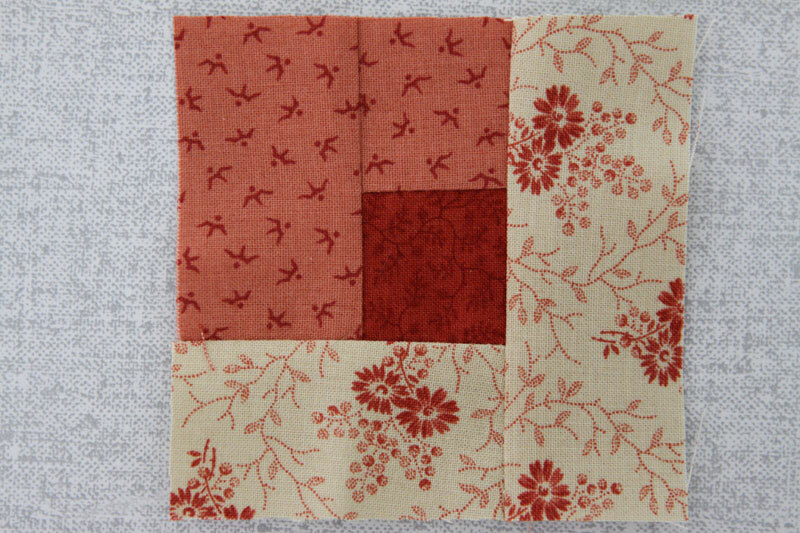 The finished block measures 7 1/4" x 7 1/4"
My fabric selection : a red center, three dark pink and three light beige. You can use any colors, but always a dark side and a light side. 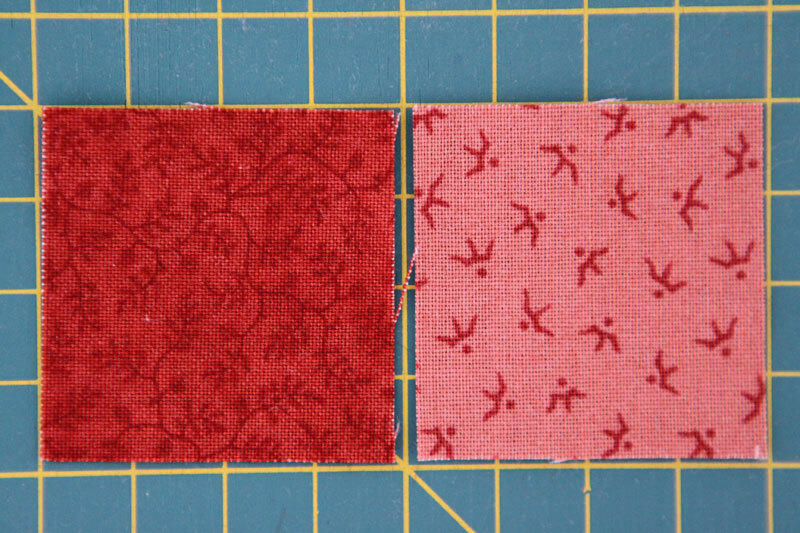 For the central square, cut 1 1/2" x 1 1/2"
Cut your strips from the Cross Grain (from selvage to selvage), width 1 1/2". 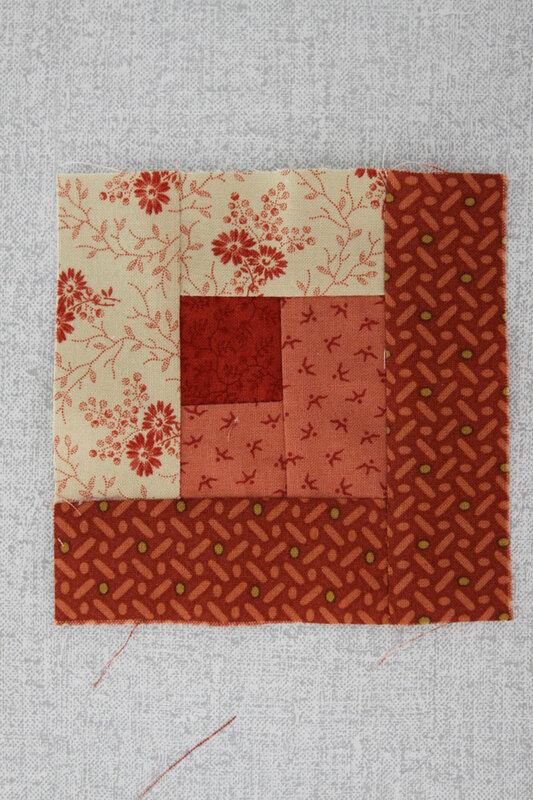 The first piece to add to the red center is a square, same dimensions as the center. Piece those two squares right side against right side. Open and press. Turn once CLOCKWISE. 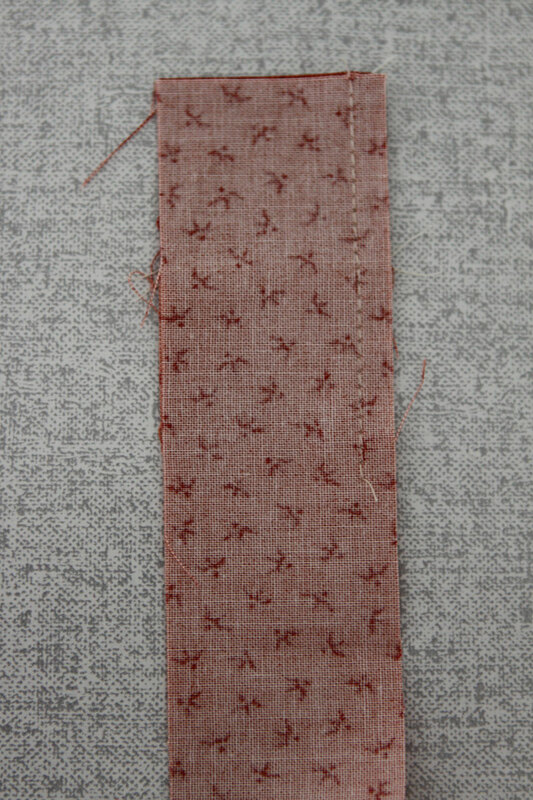 Add the strip of the same fabric, sew right side against right side. Cut the remaining length of the strip. Add the light color strip for the second row. and ALTERNATING two dark strips and two light strips. Press hot without moving your iron. 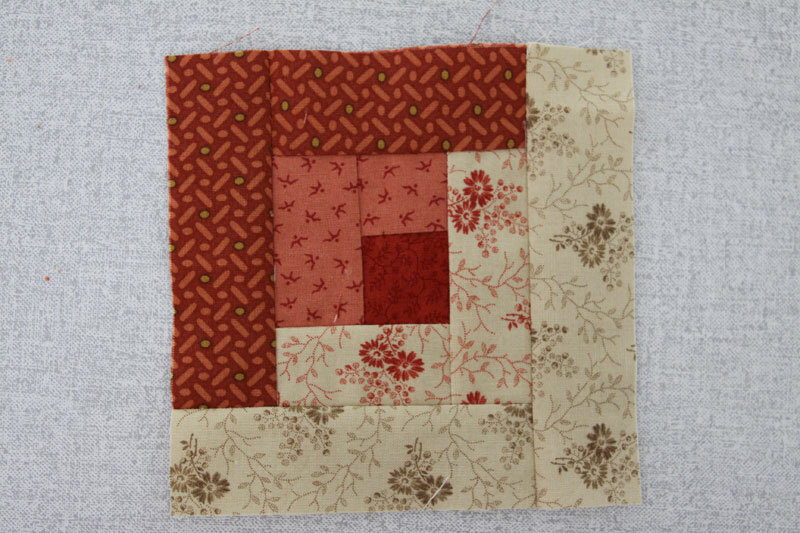 Your block is now finished, you may just need to trim the sides to get an accurate square of 7 1/2". I did mine this way also. 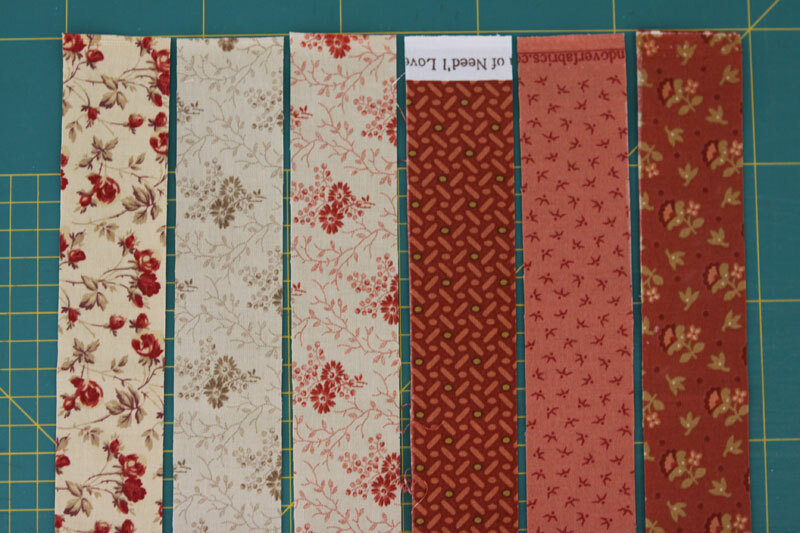 I didn't know anything about anything for my first quilt and cut my strips 3" wide. My Mother appreciated my creation, but I wish I had made the strips much much narrower. I love the look of yours. Thanks for your sharing and caring spirit. You are welcome! Thanks to you. Thank you so much for this simple explanation. I have wanted to learn to make log cabin blocks, but I thought I'd have trouble getting the measurements right. Now I am going to try your method. You are welcome Deborah! Pleased to be of help! 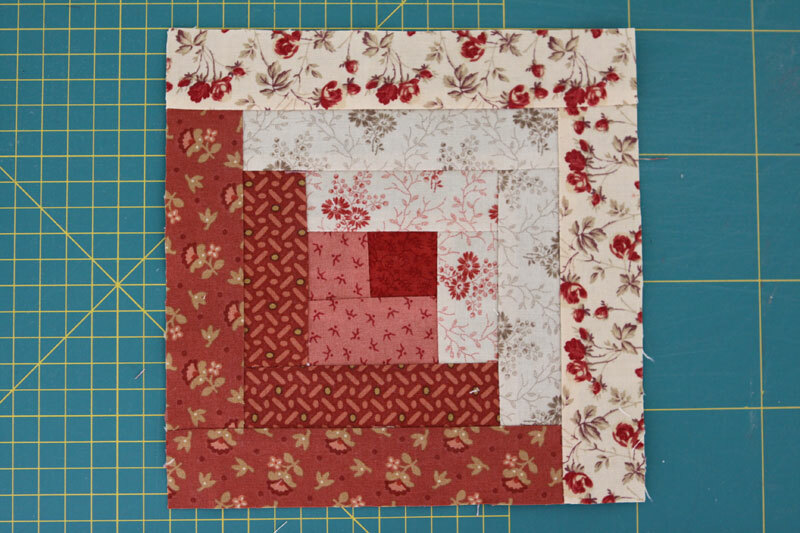 Thank you Christine for this tutorial on making a Log Cabin block! Just think of the cutting time saved by doing it this way! 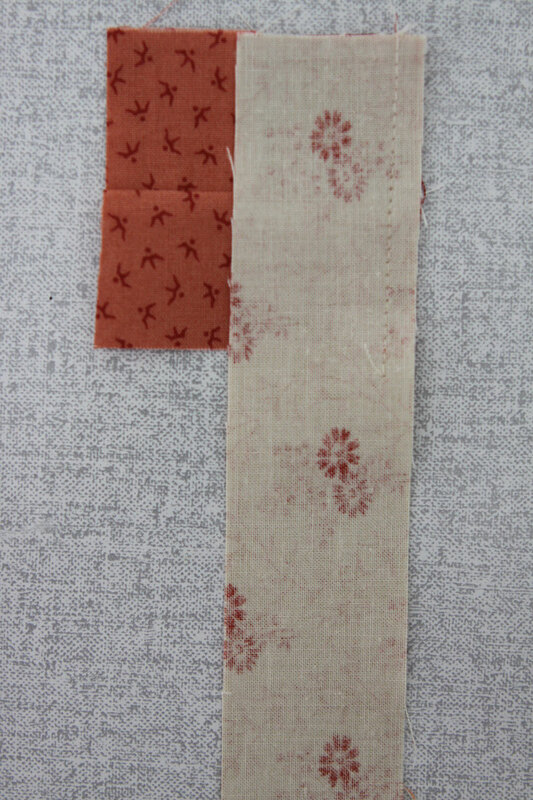 Do your remember the name of the fabric line the last round of logs is from? I have been looking for fabric like that for my daughter' s quilt. My comment got lost - so here's my second try. Thank you for the great instructions Christine! 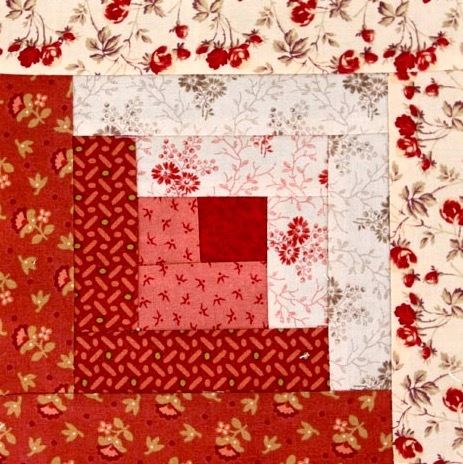 I foundation pieced a log cabin quilt once, but would like to try it without. I will have to remember that about not moving the iron. Reds and creams are my favorite and I can't wait to see your finished beauty! 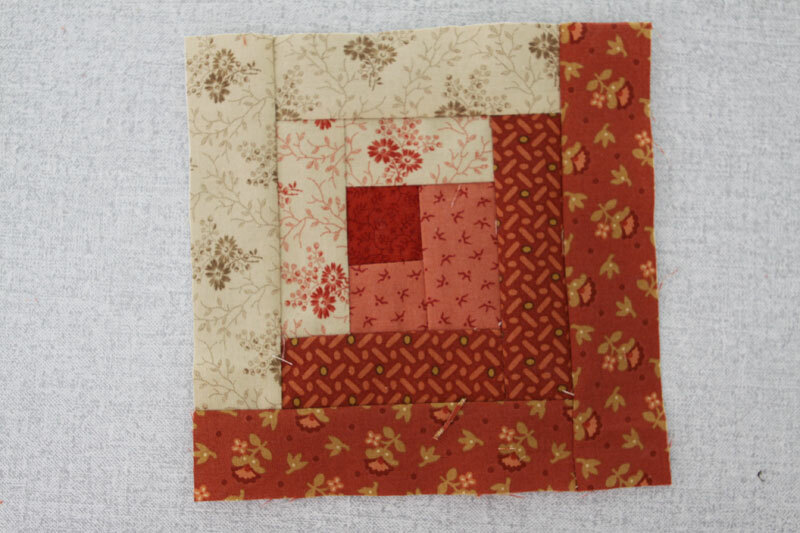 awesome tutorial, that is how I learned to do log cabin blocks and I love it. Those are some thin strips! I'm planning to make a log cabin soon and, when planning it out, was startled at how fast thicker strips add up to make a ginormous block. Nice tutorial. Great color combo! Log cabin squares remind me of my mother. That was her favorite style of quilt to make. I have yet to attempt on but I may have to soon! I'm self taught and this is how I did log cabin blocks. 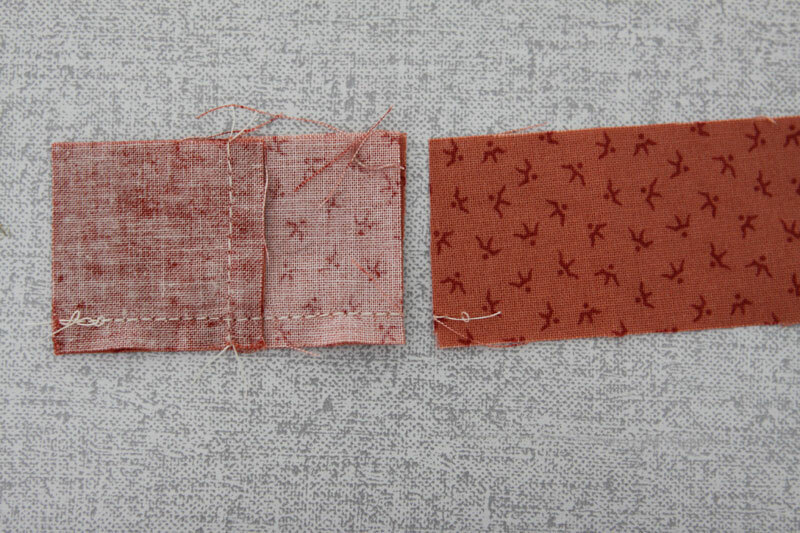 My sewing is not accurate enough to cut the length before beginning. I learned how to make a log cabin in a workshop. You do it simpler for sure. We were taught to square up after each 2 strips put on. Thanks for sharing this tutorial, Christine! I have not ever made a log cabin block before. But this is, for sure, the easiest way I can imagine to make it! I seen Paula from The Sassy Quilter is thinking of doing a Modern Log Cabin quilt along. You girls are tempting me to follow suit! Thank you for the tutorial Christine. My first quilt was a log cabin 33 years ago. I have never done another one...because it was my first quilt and you know how it must have looked. I think I'll try another. I bet it would look better now. Beautiful block! Thanks for the tutorial! 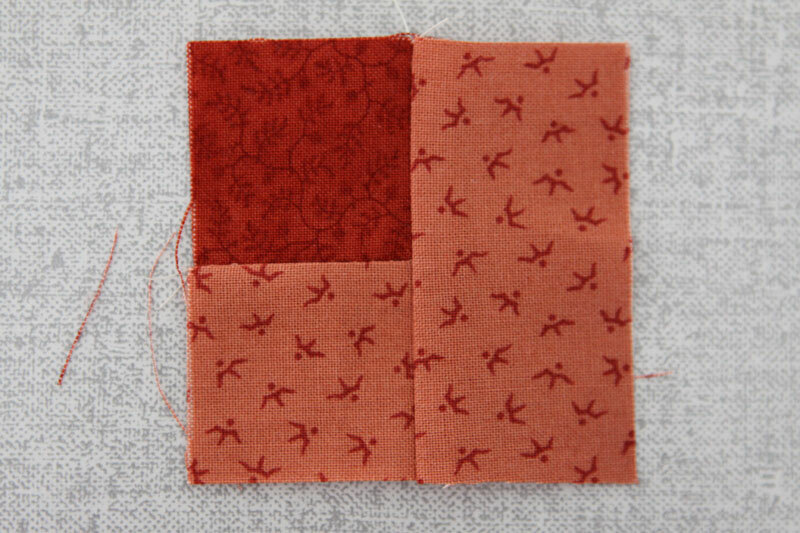 I love this, I am making a quilt as you go with very similar fabrics. I wanted to switch up the blocks somehow and wasn't sure how I wanted to do it. This will work fantastic. Thanks for the post! That is exactly how I make my log cabins ... my favorite quilt pattern (which would explain why I make so many of them - ha!). 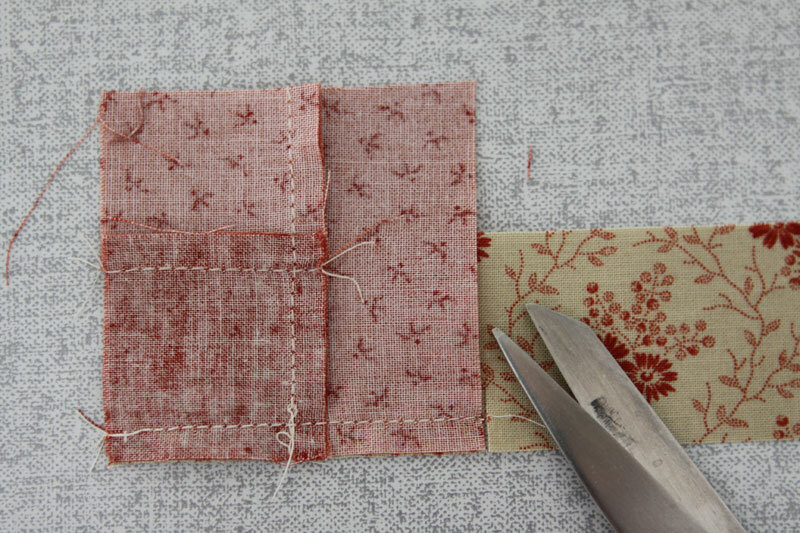 This is much simpler and less tedious than cutting all those varying lengths. I LOVE IT! 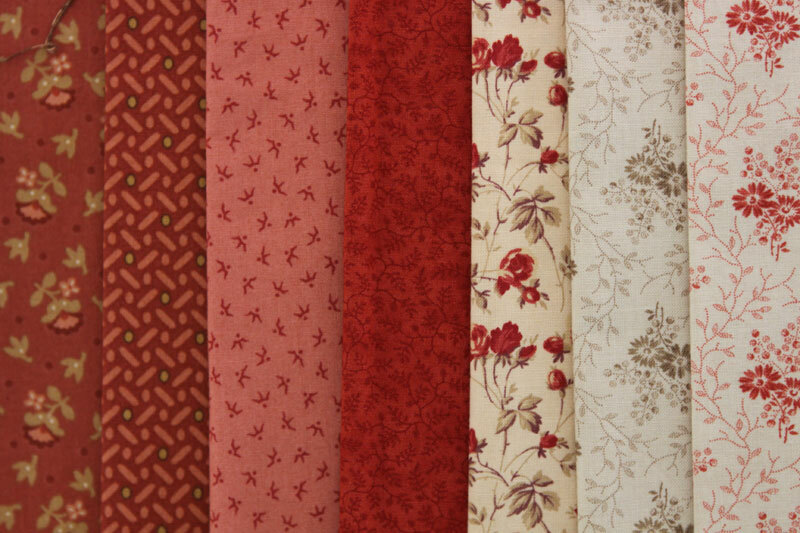 The fabrics are gorgeous! I love the easy cut and sewing instructions. I think I can do it! Thank You! You are welcome! Thank you for your kind comment! May I ask what group the final fabric is from? love the choices you made! Agree that this is the best way to work a log cabin. Merci Sandrine pour votre visite sur mon blog! Je vous souhaite de réussir votre Log Cabin. Bonne journée a vous. Hi Christine, Not sure this is timed appropriately, lol. If the strips are cut 1.5" wide and there are 7 strips across, shouldn't the squared up size be 7.5" rather than 7.25"??? 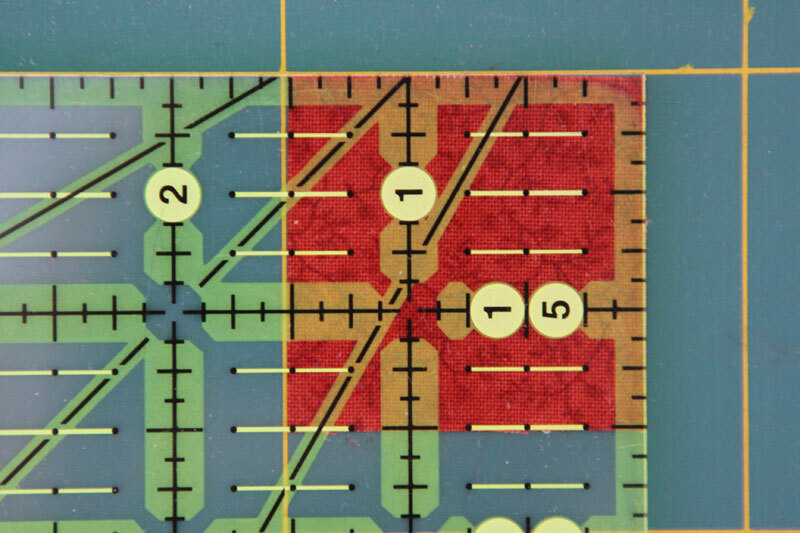 Just wondering why the block is squared smaller... am I missing something? Hi Ginger, Thank you for your comment, you are right, it should be 7.5". I am going to correct this mistake. Thanks a lot!!! 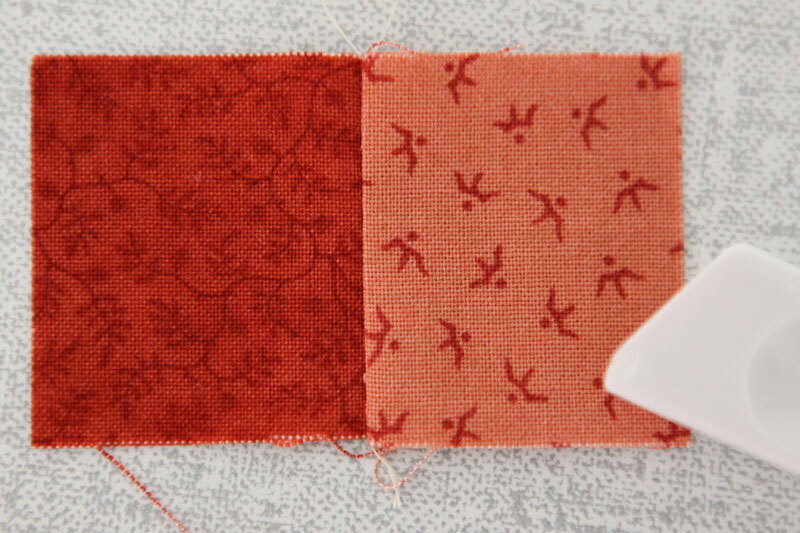 I completely understand the instructions but I need to know how much of each of the fabrics I need to purchase in order to make a twin size quilt. Is there a magic formula or do I just guess? Would be able able to tell us how long each strip is so that we can precut? I think I'm in love. I'm now making an "easy" 9-patch. My second quilt ("throw size"). Just finished an easy baby quilt. I have fabric for my next project, but I'm going to use it for the log cabin design. The dark colors are very similar. I just need to get the lighter prints. I'm so excited!!! Bless you for sharing this free pattern. Will let you know later this year how I'm doing. Hi Terri! Tanks for your visit and kind comment! I wish you good luck for your next project and I am eager to have news from you. Have a great Sunday! Thank you for the tutorial, Beautiful choice of colors! You are welcome Barbara, thanks for your visit and nice comment! It's such a nice diy project.